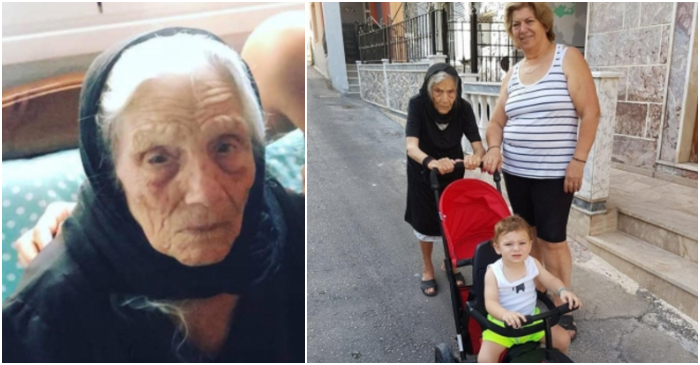 At the age of 105, and with 10 children, 50 grandchildren, 87 great-grandchildren, and 2 great-great grandchildren, Kyria Panagioula from Kalymnos is one of the oldest women in Greece, who may enter the Guinness World Records. With hair as white as snow, a warm smile and curious eyes, Panagioula has seen two world wars and is currently witnessing her country struggling from an economic crisis, however, the lovely lady still has a thirst for life and continues to live a humble life on the island of Kalymnos in an aged home care. Panagiota (Panagioula) Stefanidakis from Kalymnos was born in early October 1914, according to official documents of that time, however, without a birth certificate, it is not 100% sure as to what day she was born. Kyria Panagioula, as she is known to her loved ones was born on the island of Kalymnos and married Michael Stefadidakis. They had ten children (5 boys and 5 girls) together- Nikolaos, Christos, Pantelis, Giannis and Kostas, Themellina, Sevasti, Angelica, Georgia, and Maria. Panagioula also has 50 grandchildren, 87 great-grandchildren and 2 great-great-grandchildren to date, an achievement that is certainly impressive and could possibly give her a mention in the Guinness World Records. The inspirational lady has not had an illness and is still physically and mentally strong, going about her everyday life, walking, chatting and spending time with her family and friends.